Intra Automation offers extensive line of strong and durable Hydraulic Press Capacity 100 Mt to 2000 Mt manufacturers in India. Hydraulic press machines designed to provide precise, secure, long lasting and safe application of effective force for your business. Our range of Hydraulic Presses are available in different sizes with different specifications with the capacity of 100 Mt to 2000 Mt. Hydraulic Press machine are available in C Type and C Frame Hydraulic Press Machine , H Type and H Type Deep Draw Press Machine. We are a renowned manufacturer and supplier of extensive variety of heavy engineering fabrications over the world. We committed to provide innovate and examine fabrication technology solutions to enhance standard quality machines. 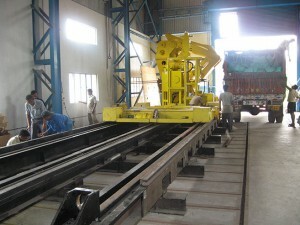 Comprehensive experience in the field of heavy engineering fabrications and material handling equipment’s. We are able to meet customer’s requirements and goals of Hydraulic Press Capacity 100 Mt to 2000 Mt. And available resources ensures that these goals meet customer budget and time.